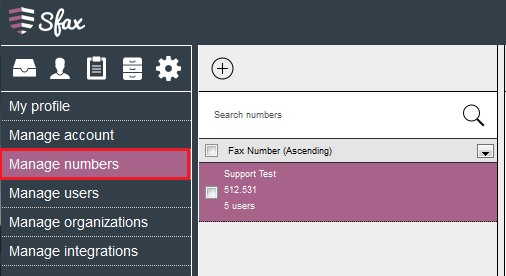 As an Account Admin or Organization Admin, you will be able to modify what fax numbers your users are assigned to, as well as their notifications on those lines. In order to access these options within Sfax, you will first need to login to the portal (located at https://app.sfaxme.com). Which will default to “My profile"
From here, you will have two choices. 1. 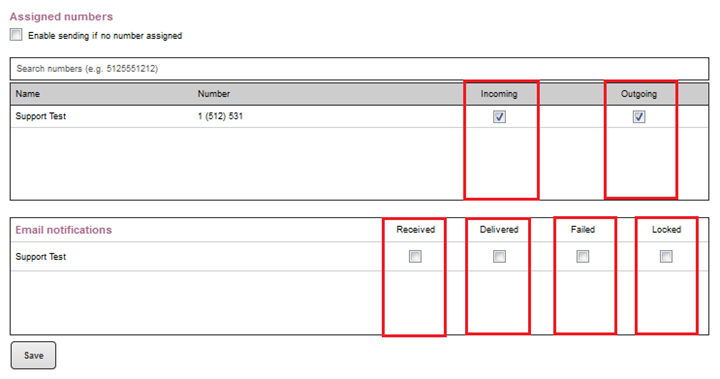 Select “Manage numbers” from the left column which will then display all available fax lines in your account. Selecting an available fax line will provide information about the fax line, and a list of available users and the notification settings for any assigned users. From here, you will be able to assign new users to access fax lines or manage their notification settings for these lines. Incoming Access to all inbound faxes on this fax line. Users will be able to see any faxes that are sent to this fax line, without restriction. Delivered Email notification that a fax has been successfully sent on the associated fax line. This is set on a per line basis, so all users that are enabled for “Delivered” will receive a notification if any user sends a successful fax. Failed Email notification that a fax has been not been successfully sent on the associated fax line. This is set on a per line basis, so all users that are enabled for “Failed” will receive a notification if any user sends a unsuccessful fax. Locked Admin only setting. 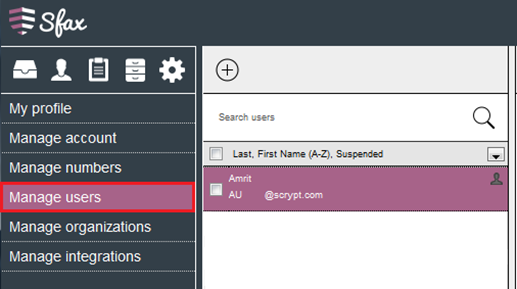 This setting prevents a user from changing their own notification settings, and is only available to Account Admin or Organization Admin users. 2. 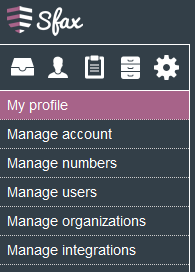 Select “Manage users” from the left column which will then display all available users in your account. 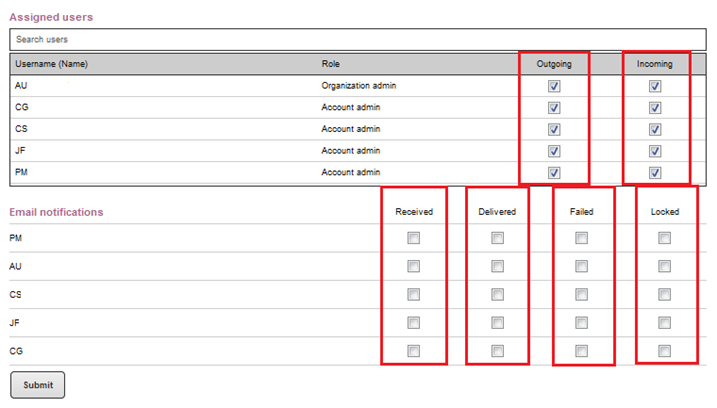 Selecting an available user will display their account information. Scroll down to the “Assigned numbers” section. From here, you will be able to assign the user to any necessary fax lines and modify their notification settings for each fax line.You also have the option to allow the user to send without an assigned fax number. Enable this option by placing a check in the "Enable sending if not number assigned" box on the top left corner of this section.